May 11, 2015 - PRLog -- The New Jersey Auxiliary – Wives Behind the Badge, Inc. is proud to join one of the fastest growing initiatives for the organization to date. 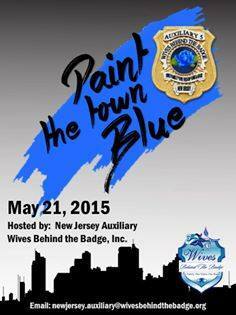 “Paint The Town Blue” will be held on Thursday, May 21, 2015 across the entire state of New Jersey. For more information, join their event page: https://www.facebook.com/events/836533393086020/ (https://www.facebook.com/events/836533393086020/?__mref=message_bubble). The Auxiliary hopes to receive support from businesses and residents who will agree to display blue in windows and on doors throughout towns and cities, big and small and share photos on social media. Individuals or businesses who wish to participate are encouraged to email the Auxiliary at newjersey.auxiliary@wivesbehindthebadge.org or phone/text 609-709-1355 to arrange for delivery or pick-up of donations of ribbons for people to display, thank you letters for police departments, etc. “Paint The Town Blue” is being held in conjunction with the parent organization’s event “Step Out in Blue,” which encourages supporters of law enforcement to simply wear blue on the third Thursday of each month. The New Jersey Auxiliary – Wives Behind the Badge, Inc. is a registered not-for-profit in the state of NJ and was established to support law enforcement officers and their families. All monies raised in and for the state remain there to assist in times of need and through the parent organization’s programs. Find them on social media through Facebook and Twitter. Donations can be made through PayPal or by visiting Wives Behind the Badge, Inc. online. Wives Behind the Badge, Inc. is an all volunteer non-profit organization dedicated to serving as a positive voice for our law enforcement community since 2006. Donations are appreciated via paypal to donate@wivesbehindthebadge.org or mail checks payable to Wives Behind the Badge, Inc., 1175 Shaw Ave Ste 104-397, Clovis, CA 93612-3932. NOTE NEW JERSEY WBTB as Wives Behind the Badge has auxiliaries across the country. : Wives Behind the Badge, Inc.